The bedroom in Leone Elliott's home has 12-foot ceilings and 10-foot windows overlooking a center courtyard. ECKO360 / Courtesy Leone Elliott. 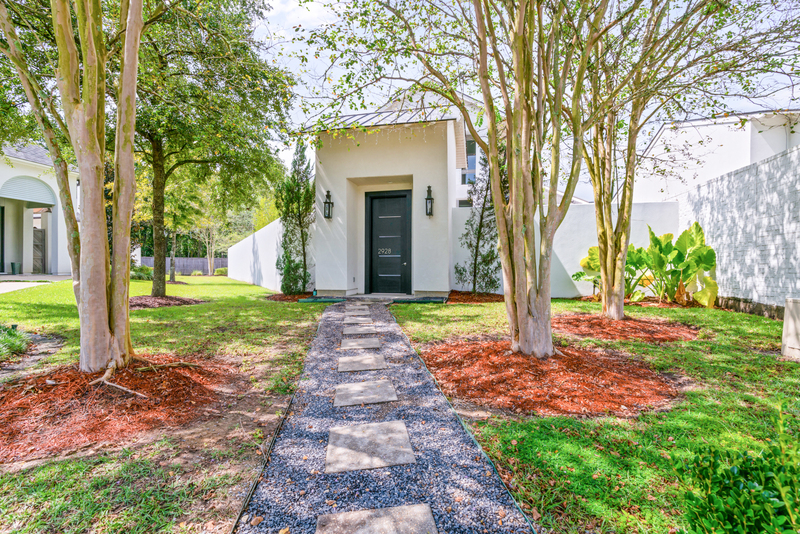 In the Bocage Lakes neighborhood, with tight, manicured lawns, stringent construction standards, and a gate that closes firmly behind homeowners and their guests, sits a house far different from the norm. At least on the inside. From the outside, this house was created to blend seamlessly with the classic suburban scene. But one step through the 9-by-6-foot, industrial-style front door, and the outside world melts away. A floating wall separates the entrance from the wide-open spaces of the common areas of the house. 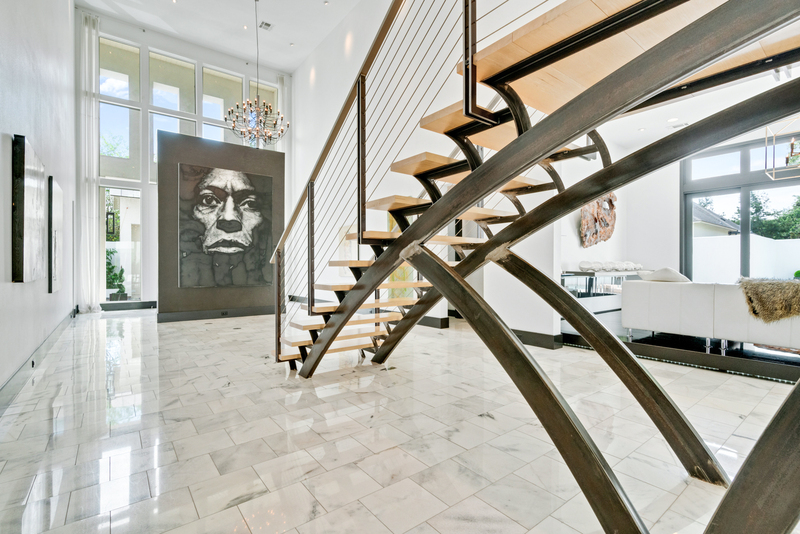 Homeowner Leone Elliott drew the stairway and commissioned David Cano with Iron Designs to create it. “From the side, it looks like an exam table,” Elliott says. Photo by ECKO360 / Courtesy Leone Elliott. The grand, modern aesthetic Elliott employed in creating this abode is a surprise indeed. 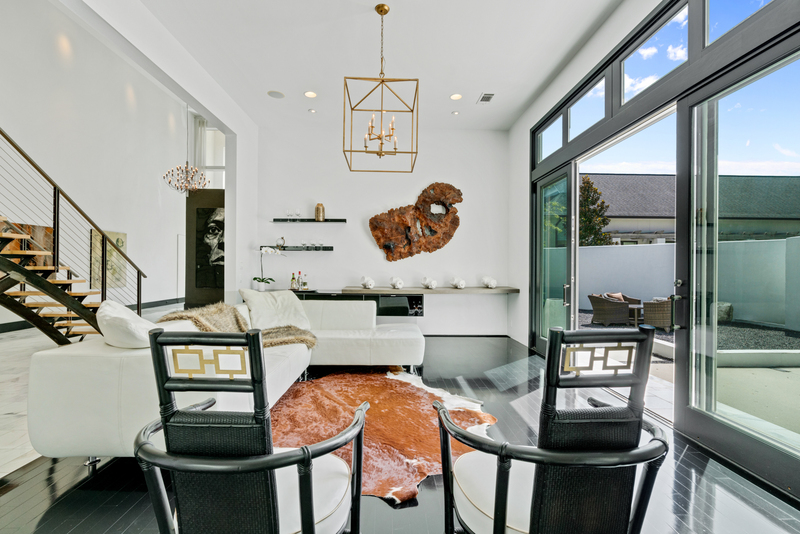 Ceilings soar to 24 feet in the foyer, a floating staircase stands like a sculpture in the front hall, and an open-concept common area offers ample space for entertaining guests as well as raising children. 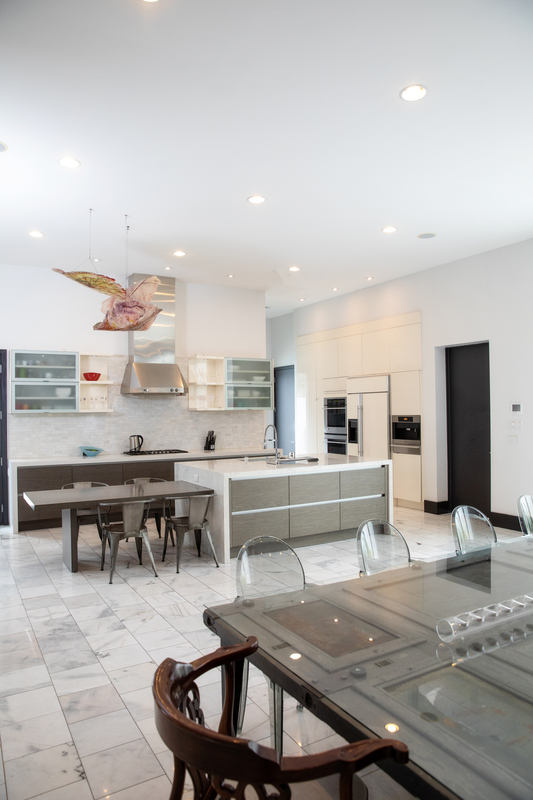 The kitchen, dining and den areas are wide open to each other and extend to a central courtyard beyond. Elliott and his wife, Sophia, built the house 10 years ago and implemented design concepts—common now—that were forward-thinking for the time. Eco-conscious elements include an 8-foot perimeter wall that creates privacy but allows natural light to stream in the oversized windows without the need for curtains. Natural cabinetry was imported from Brazil for the kitchen and bathrooms, a tankless water heater was installed, and A/C units were separated into zones. Although private from the outside, each room opens to its own courtyard to meld inside living with nature. Elevated, high-gloss ebony floors separate the sitting room from the open areas around it. A Tony Mose sculpture, made from charred foam, anchors the wall. The sofa is the perfect perch to view activity in the outdoor pool just beyond the windows. Photo by ECKO360 / Courtesy Leone Elliott. 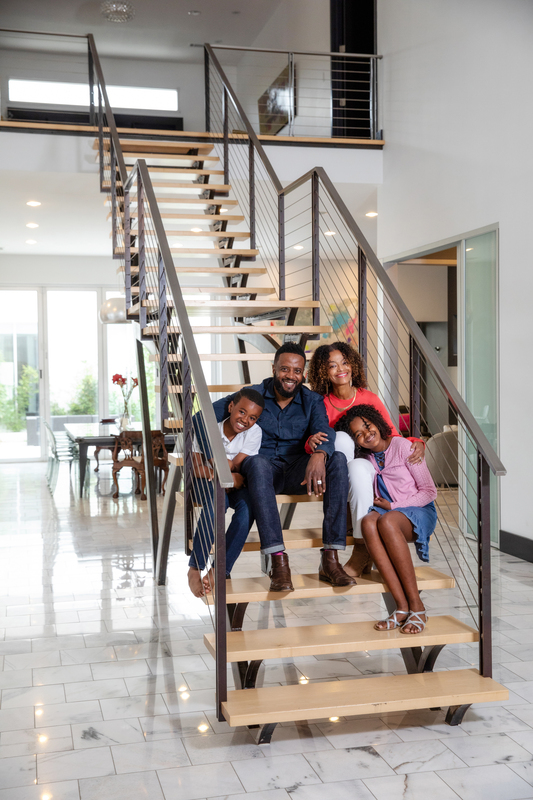 The family turned to Dwayne Carruth, architect with The Front Door, to take the floor plan Elliott had scribbled on a napkin and transform it into a house with a clear, minimalist vibe. The front part of the home includes guest suites for visiting relatives; the central part of the home is the open-concept common area; and the back part of the home includes the private family rooms. 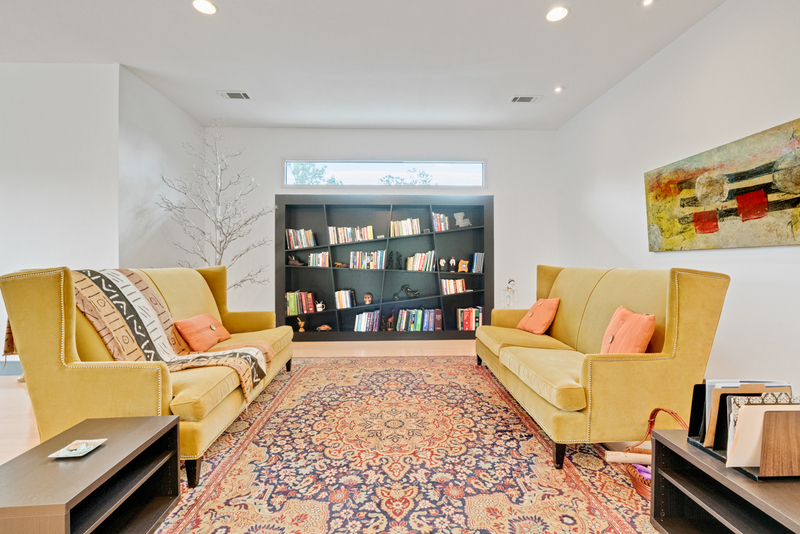 An upstairs library and workout room completes the residence. Elliott fell in love with an unusual bookcase available through the contemporary design company Ligne Roset. He had his trim carpenter build one to mimic high-end shelves, and placed his custom piece in the upstairs reading area. Photo by ECKO360 / Courtesy Leone Elliott. What also stands out is the attention the house has received from those outside the city. Elliott’s home has been leased three times for directors and producers to stay in while shooting films in the area, most recently by Tom Hanks. During these times, the Elliotts have moved out to accommodate the celebrities (and let Hanks enjoy the Miele coffee machine). But they have always been delighted to return to their modern oasis. A gateway door on the exterior of the home opens to a welcoming courtyard before the formal entrance to the home. A perimeter wall wraps the property and ensures privacy for the homeowners. ECKO360 / Courtesy Leone Elliott.